It's Bond in space, so what's the problem? Well, part of the problem is the fact that Bond doesn't actually make it into outer space until the last little bit of the movie. But this is a relatively small issue—after all, Bond spends most of the franchise not in outer space. What's more troublesome is that all the time he spends faffing about on Earth is rather dull and uneventful, and once he makes it outside our atmosphere it doesn't get much better (even the inevitable laser battle manages to be dull, executed like the massive but faceless underwater battles in Thunderball). Beyond two acceptable action scenes, there's just nothing going on in the narrative. Something about a guy launching shuttles into space, but Bond seems more interested in bedding the helicopter pilot than figuring out where she's taking him. And to make matters worse, this is possibly the most forgettable villain in the whole series. Mr. Goatee Man is given nothing to do but explain his plan to 007, and the movie seems to recognize its failure to make him properly villainous when it desperately has him kill one of his assistants for no real reason. And then the movie shoots itself in the foot by taking Jaws, one of its better bad guys, and giving him a love interest who turns him into a cuddly little teddy bear. Even Holly Goodhead, a relatively empowered Bond Girl in spite of her awful name, is wasted with a disappointing "will they/won't they" relationship (of course they will, even if they shouldn't). Perhaps the biggest disappointment for me: the political subtext (one of the strengths of the previous installment) is left limping along the surface. Bond asks his female counterpart if they can have "détente" as if to ask the audience, "Do you get it?! It's about the space race!!" Ironically this was already old news at this point. Moonraker had as much distance from the moon landing as we do now from Hurricane Katrina, and the US SkyLab (the more direct referent for Mr. Goatee Man's space station) had already returned to Earth. Moonraker is more a response to the popularity of Star Wars than the political tensions of the cold war, and its lack of subtext is the direct result. Roger Moore is really starting to show all of his 52 years. Not only does he look wrinkly next to his too-young female co-stars, his action scenes are becoming increasingly less believable (the incident with the centrifuge is so artificially sped up it's silly). Bond has had a great history of being characterized more by his sophistication than his youth (his average age is right around 43), but Moore is actually three years older than Connery in real life, and he accounts for all 5 of the 5 oldest Bonds (Brosnan is 6th in Die Another Day at 49). Ultimately these are just numbers and if he pulls it off then more power to him, but he feels an entire generation older than Connery, and when he spends more time canoodling than fighting things start to feel off for me. 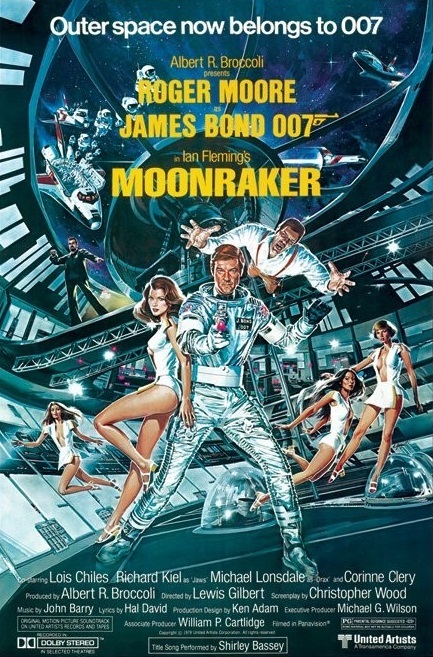 Honestly I was dreading my return to Moonraker, but it wasn't actually as bad as I expected. It's boring, and the way it tries to capitalize on the success of Steven Spielberg and George Lucas is regrettable, but it's not an awful movie. Disappointing maybe, and derivative of much more than just the Bonds that came before it, but small successes like the skydiving opener (despite its laughable stunt doubles) and Jaws becoming a cheesy punchline instead of a threat (despite the way it undercuts his previous villainy) manage to keep the tone light (and corny) and pull this up from the bottom of the Bond barrel. It's still pretty close, though.